April First Friday: Two Years of Chroma Studios! The featured artist this month is Chroma Studio’s own Paula Manning Lewis, owner/proprietor. Paula will be showing us new work featuring a twist on artistic harmony. 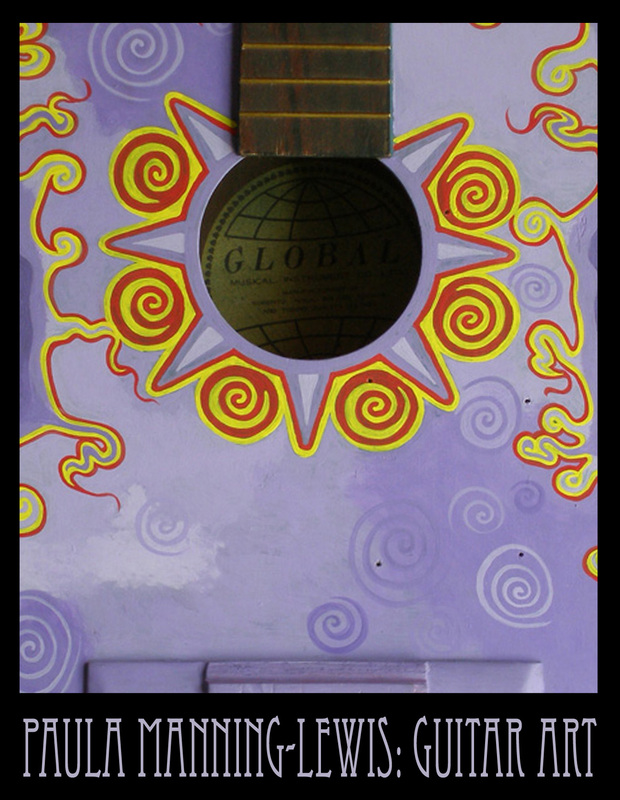 This collection of work includes artistically painted guitars, allowing art & music to collide. Studios downstairs will be open and artists will be here to answer questions and share their work spaces. Albuquerque SLAM Poets will be here offering their art of the spoken word. Join Carlos Contreras, Kenn Rodriguez, Hakim Bellamy and friends for their thought provoking & always entertaining poetry. Various musicians will bring us musical entertainment throughout the evening. Wayne Shrubsall will perform his banjo music. Danny Clayburn will entertain us with his talents of playing the bottleneck slide. John Simmons, the “Human Jukebox” will invite us into his world of musical storytelling. This is only a short list of what is materializing in the performance space for this coming First Friday event. A new twist on poetry, Elevator Haikus with Zack and Té, will be going on throughout the evening. Ride the elevator to the downstairs studios and hear a haiku! Our kids art studio (for kids of all ages) will be open and chock full of supplies for art making! There will be a scavenger hunt with prizes! This will be an evening full of entertainment for all; visually, musically & generally all encompassing good times. We hope to see you here. Gearing up for April Anniversary Celebration! April marks Chroma Studios 2nd year in business and our first year downtown! Hard to believe it’s already been 2 years, but time does fly when you are having fun. 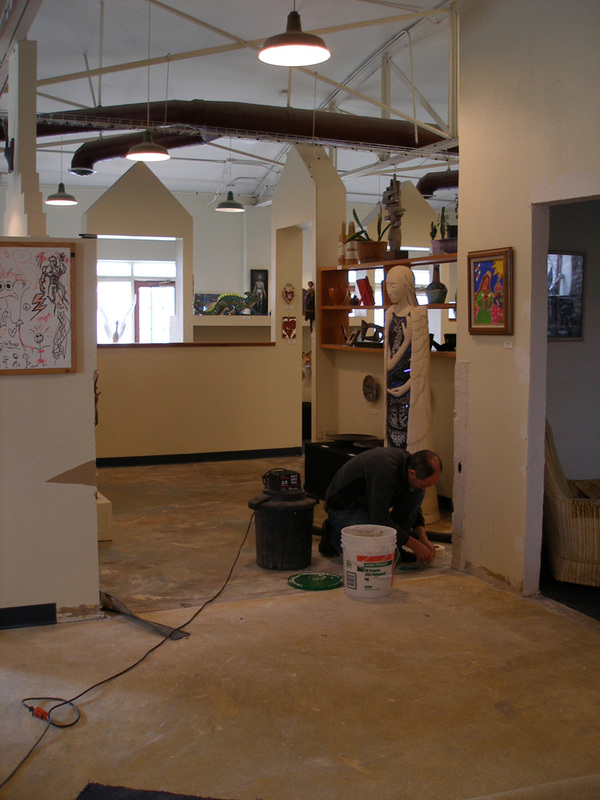 This month we are gearing up for the big show with some improvements to the gallery and studios. Aaron just tore down a wall in the gallery to open up the space and make it flow better. Pictures are posted below. We are also tearing up carpet and painting floors, something we’ve talked about doing since we first moved into the building. Downstairs in the studio hallways, we’ve already done some painting and hung more art. April also means open studios for our First Friday opening event. You will be able to see inside the artist’s studios and see where the art is made. I will post more information about the Anniversary show as the date draws near, lots of fun activities planned, should be exciting! 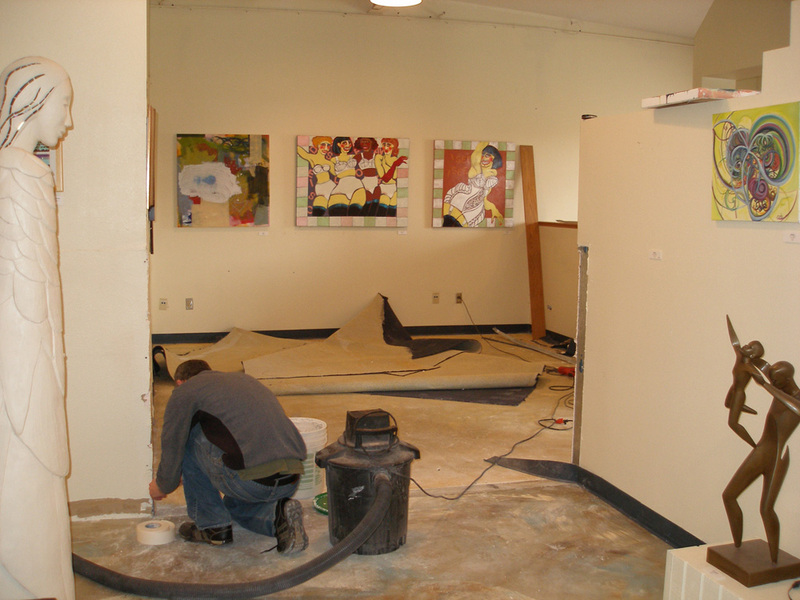 Aaron working on opening up the gallery space! March is here and spring is in the air! This month’s featured artist is Caroline C. Blaker, painter and web designer extraordinaire! This month we are becoming even MORE kid friendly with the addition of a kid’s art studio, a NEW area in the gallery with art supplies and musical instruments for your kids to play and make fun things while you enjoy the show. Friday, March 5th, 6-10pm: First Friday Art Opening; Featured artist Caroline C. Blaker will be showing her recent Pixelation paintings on latex, and her new digital deviation, Twitterscapes: Paintings with Twitter. 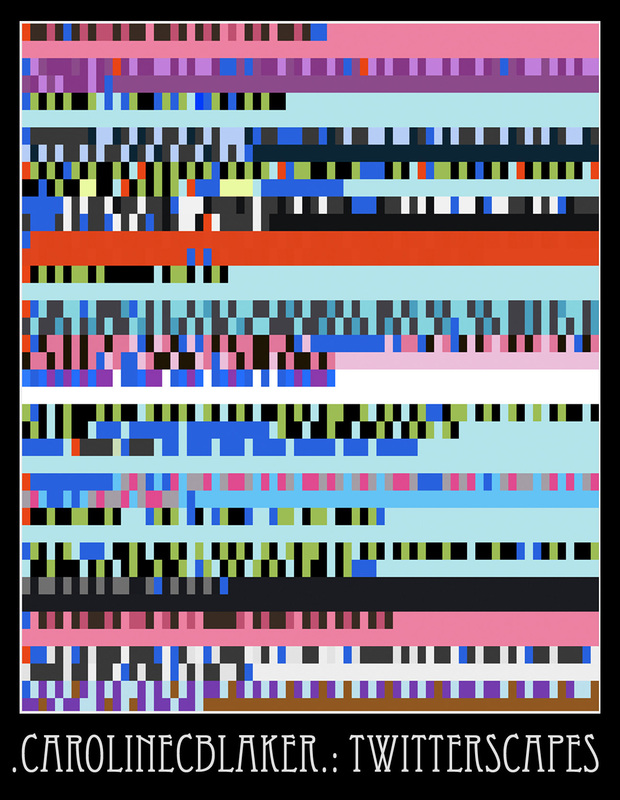 The show will likely feature realtime user-generated Twitterscapes, as well as Pixelation paintings of all sizes and Twitterscapes in print. Friday, March 26th, 7:30pm: Storytelling with Susi Wolf. Silk Stockings – a Celebration of Women Through Storytelling. Since March is Women’s History Month, we are celebrating women through an ancient tradition – storytelling. Come enjoy multicultural tales of women and the feminine experience throughout the ages. Hear clever woman stories, strong woman parables, she-roe tales and more. It’s time to celebrate the wonder and mystique of those who wear Silk Stockings! Tuesday, March 30th, 7:30pm: AMP Concert featuring Walter Strauss & Mamadou Sidibe. When American guitarist Walter Strauss and Malian kamal’ngoni master Mamadou Sidibe engage in a musical interplay of finger-style guitar and West African hunter’s harp, the result is a deep, soulful music that is simultaneously ancient and fresh. These two unique musicians from distant origins create an intoxicating blend of music in which they gracefully complement each other through intertwining melodic grooves and spirited improvisation. To hear these two musicians from far flung places collaborate is to to take in two souls, listening and greeting one another in a universal language—seamlessly interweaving two continents and two bright musical sensibilities. Coming up in April: Chroma Studios 2nd Anniversary show! First Friday in April we will have the downstairs studios open, plus lots of live music and poetry throughout the building, activities for kids of all ages, door prizes and lots of fun! Would you like to get 10% off ALL purchases, and 2 FREE Intimate Concert tickets? Become a Chroma Studios member today! $35 yearly membership for individuals, $50 for businesses (Businesses also get a mention in our monthly newsletter and a link on our website). Make sure to stop by Chroma Studios this month, we would love to see you!